A few days after the University of Iowa was named America’s premier party school, a bloodied undergraduate arrested early this morning for public intoxication explained to cops, “Of course I'm drunk, it's Thursday night in Iowa City." 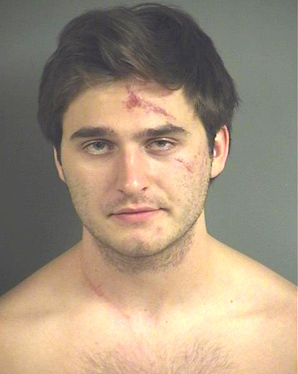 According to an Iowa City Police Department complaint, officers responding to a bar fight encountered a shirtless Alexander Kinzel with blood on his arms and face. Witnesses said the 21-year-old student refused to leave the bar and got physical with staff before being removed from the drinking establishment. Detained by investigators, Kinzel registered a blood alcohol content of .248 (more than three times the legal limit). After the test Kinzel told a cop, "Of course I’m drunk, it’s Thursday night in Iowa City." Kinzel was then arrested and taken to the Johnson County jail where he posed for the above mug shot. He currently remains locked up on the misdemeanor charge. The Princeton Review this week released its annual college guide rankings, naming the University of Iowa the country’s top party school. The university, which ranked second last year on the list to West Virginia University, also topped the Princeton Review’s latest “Lots of Hard Liquor” category.